While wandering about Whole Foods on Saturday looking for the raisins, I stumbled across a display that included these two teas. Whole Foods remodeled their Wheaton store. The gal I talked to when I couldn't find frozen veggies said they were able to add 8 feet to the ends of their aisles which means more organic products. They moved bulk food over by produce into an area that was brighter and with more space. So things like these teas could be provided in an end cap display where people like me could stumble upon them, sniff the boxes and say, "Oooh!" There are five holiday flavors but I felt I could only buy 2, plus one of the flavors is peppermint and I don't care for that. These two were the most appealing. The others are Candy Cane Lane, Sugar Cookie Sleigh Ride and Nutcracker Sweet. 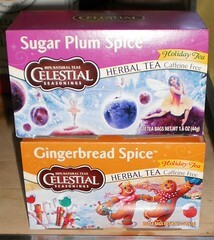 After a weekend and half a week of having these in the house I can say the Gingerbread Spice is extraordinary. I need to get another box of this. It is so good, smells heavenly and the bag makes at least 4 cups of strong tea. If you don't like your tea strong, be careful how long you steep this flavor. The Sugar Plum Spice smells really nice in the box. The taste, however, was a bit too spicy for me. I guess I was expecting something more fruity and this is more spicy. It's good but I have to watch how long I steep the bag or it gets kind of bitter to my taste. So I recommend that you try to find one of these since they are special issue for the holiday. If you get a box of the others, let me know how you liked them. Is It Schadenfreude To Be Happy About This? I Love These Kinds of Nights. What a Difference a Week Made!